The Off Channel is an atheist blog focusing on the harm caused by God claims and the lack or logic or reason for supporting those claims. It offers no punches pulled opinion entries about religious claims while lightening the tone with the use of comic strips created by the author. It provides an outlet vent frustrations, express curiosity and hopefully engage new people whether they&#8217;re like minded or not. 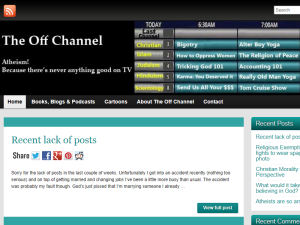 This what your The Off Channel Blog Ad will look like to visitors! Of course you will want to use keywords and ad targeting to get the most out of your ad campaign! So purchase an ad space today before there all gone! If you are the owner of The Off Channel, or someone who enjoys this blog why not upgrade it to a Featured Listing or Permanent Listing?